This chapter serves as a short introduction to the section. Thus, aside from providing an overview of each of the chapters herein it offers an orientation that might assist readers in connecting ideas throughout the entire section. What does become clear is that the work for education and educators going forward is likely to be substantial, these are not chapters interested in tweaking what currently exists. Sometimes changing an ethos, a metaphor, and an accepted way of things is easy. Take the word ice, take the word coffee, stick them together, and soon everyone is sipping on a cool summer drink. Childhoodnature is not that easy, particularly within a worldview that has separated them. But even if we want to bring childhood and nature into a unified whole – culturally, educationally, and politically – it is harder than the simple creation of a neologism suggests. And in their own ways, the four chapters in this section are examples of and suggestions about the work that needs to be done to close the gap between human children and the natural world. All the chapters are clear in enunciating a problem, one that has implications across the spectrum of the human condition, including health and well-being, empathy, belonging, physical fitness, cognitive functioning, mental acuity, psychological health, and political engagement. Each chapter responds in its own way, from the local to the global, from the specific to the general, and from the practical to the political and philosophical. The chapters offer visions, philosophies, and actions in response to the complex challenges. What is also clear is that the work going forward is going to be substantial and that there are allies, compatriots, and grassroots organizations all over the place that it would behoove educators to partner with and learn from. Several themes emerge over the course of reading these chapters. There is the sense of the importance of interaction, of having children spend significant amounts of time outdoors and engaging with the natural world and in having these interactions understood and named differently. There is a sense of the need for experience, for children to be immersed in, to be sensually engaged with, and to encounter diverse natural places and beings. This not only provides for the possibility of building relationships, but it also gives students an expansive baseline with regard to what wild and natural might mean, rather than having that baseline slide into overly manicured parks and indoor terrariums as the most biodiverse worlds they know. This discussion also leads into a return of the wild and wilderness in ways that respond to the critique of social construction but that also do rich work acknowledging an active, agential, vibrant, buzzing natural world. There is also a sense that the imagination is important for both learning, as in the range of affordances, and the work the child must to do turn sticks into brooms, cars, and dolphins, and also for the future, as in having the imaginative capacity and flexibility to go beyond the edges of the community and cultural norms in which they currently find themselves. And finally, there is a sense that this is not a small project these chapters are considering. This is about changing the culture and the relationship many humans have with the natural world. This includes potentially thinking about nature as teacher and partner, to changing the language and metaphors being employed, to rethinking education, the wild, and the human condition. In their work, Charles and Louv offer a wild hope as the lynchpin to a “new nature movement” that might go beyond traditional environmentalism and the current educational status quo toward a better society. It is a society in which people flourish in an expansive way alongside diverse other-than-humans. Through their work with the Children & Nature Network, Charles and Louv offer research findings that reach into many areas of life – education, mental health, physical well-being, and more – and thus speak cogently to the role nature can play in all our lives. There’s in an energetic vision, a political project, and a grassroots movement which ends by offering examples for families, educators, and communities who are close to home and easily enacted but who are capable of building the kinds of connections and resiliencies necessary to change the story and maybe more. In quoting Illich, they bring these four chapters into harmony: four different but complementary voices. For their part, Sobel, Larimore, and Becker-Klein bring us a working example of a partnership created between a local nature center, its early childhoodnature-based program, and the nearby K-3 elementary schools. Their research involves a qualitative informal case study method; and their results point in the direction of five important benefits: (1) increased motivation and enthusiasm for school; (2) enhanced language development; (3) increased science, technology, math, and engineering (STEM) learning; (4) improved physical development; and (5) the development of executive function capacities. The authors see the public push toward “academification,” “indoorification,” and “digitalization” as wedges that pry apart childhood and nature. They also write of negotiations between nature-based programming experts (educators from the nature center) in partnership with school-based educators that can expand the curricular purview while shifting accepted epistemologies, how time spent in near daily immersion in the outdoors can bring forth the expanded range of learning possibility the natural world has to offer, how turning toward longer periods of child-directed/adult-facilitated play and problem-solving can move the culture of separation and allow the natural to embrace the learner, and how the increase in parental involvement and support of flexible administration can provide space for relationships to flourish. All of these actions become part of an educator’s toolbox for closing the gap between childhood and nature. The story expands with Kahn, Weiss, and Harrington who suggest that the childhood and nature gap is partly caused by the lack of direct experience that children have with an increasingly degraded natural world. 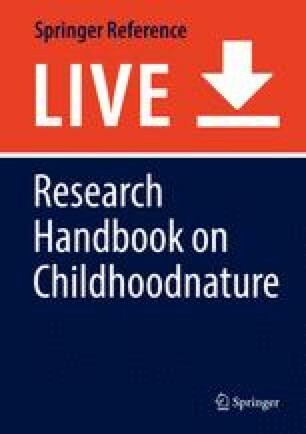 The authors suggest that people construct knowledge of what is “normal” nature based on the interactions with nature that they experience in childhood. The crux is that with ensuing generation the amount of environmental degradation, if not destruction, increases, but each generation tends to take that nature as normal nature. They call this the problem of “environmental general amnesia,” which they say helps explain how cities continue to lose nature and why people do not really see it happening, and to the extent they do, they do not think the loss is too much of a problem. Environmental generational amnesia also helps explain why typical solutions, like classroom environmental education, which focuses on teaching facts and conceptual knowledge, are not well suited for helping children really understand the problem “in their bones.” Their solution is to have children interact with a nature that is more wild than not. Against this intellectual backdrop, Kahn, Weiss, and Harrington systematically observed the interactions of young children in a forest school in Seattle, Washington. From their observational data, the authors generated what they call a “nature language.” This language is comprised, like words in a dictionary, by what they call “interaction patterns”: characterizations of essential features of interaction between humans and nature, specified abstractly enough such that countless different instantiations of each one can occur – in more domestic or wild forms – given different types of nature, people, and purposes. For example, walking along the edge of water and land is an interaction pattern. So is climbing a tree, imitating animals, and imagining nature to be something other than it is. Intriguingly for this discussion of closing the gap, it becomes apparent that these authors are suggesting that compared to the urban world, the natural world offers a wider range of affordances to the young learner, which in turn allows the child to exercise an imaginative range that is often not available in a more domesticated environment. What also appears in this nature language is the arrival of a language that is action-based. Note the verbs that lead each interaction pattern; and then note that each verb is interconnected to another being as part of each descriptor. One wonders if this is not in fact the language of the childhoodnature world: a language that recognizes interdependence, action, and possibility at the same time. In the final chapter of this section, Blenkinsop, Jickling, Morse, and Jensen step back from the more direct work in schools of the last two chapters to offer a more general philosophical response to the problem of the childhoodnature gap and suggest some pedagogical touchstones that might support the kinds of educators engaged in the aforementioned work. The authors also place education at the heart of this cultural change project, but it is an engaged, activist, and critical educator who is able to step away from the traditional human-teacher-centered educator role and question the assumed norms that form the framework for public education as it currently exists in much of the world. This chapter begins by exploring and rethinking three seemingly disparate strands, wilderness, education, and the anthropocene, for the purposes of having each offer comment on the human problematic of control which the authors suggest has contributed to the childhoodnature divide. Troubled by the anthropocentrism and the desire to control that have led to the devastation of the anthropocene, the dismissal of wilderness, and the limitations of public education, the authors then offer up six touchstones, forming a heuristic of sorts, for wild pedagogies. These touchstones then become challenges to return to and commitments to make that educators can respond to and draw upon as they continue the slow work of changing practice and troubling systems. To return to the metaphor of telling a new story, this chapter is about changing the actors and the ways of being in world so that new possibilities can be generated for how the story will end. Possibilities include a world where the wedges between children and nature have been removed, or at least reduced, and where childhoodnature makes sense not only as an idea but as the way in which we actually educate and live in the world.